From the late Third Intermediate Period to the late Ptolemaic Period, there was a widespread type of amulet in the form of a 'stela' or round-topped plaque bearing hieroglyphic inscriptions over all surfaces, and on one of the two main faces a raised relief figure of the god Horus depicted as a child, standing on crocodiles and holding scorpions, snakes, desert gazelle, and lion. The hieroglyphic inscriptions present incantations to be recited to protect the body against harmful creatures. Most Horus stelae are small portable amulets, examples in the Petrie Museum being UC 16545, 16546, 16568. These may derive from Ramesside and Third Intermediate Period sculpture on a larger scale in temple settings, and of larger size; even in its incomplete condition, the unprovenanced limestone example UC 16547 measures 37.5 cm in height. The larger versions and the portable amulets are both generally known as 'Horus stelae', in some publications 'cippi' (cippus being an alternative word for stela). It is not known whether they had a specific name in Egyptian. Sternberg-el-Hotabi 1999 provides a detailed investigation into the type. 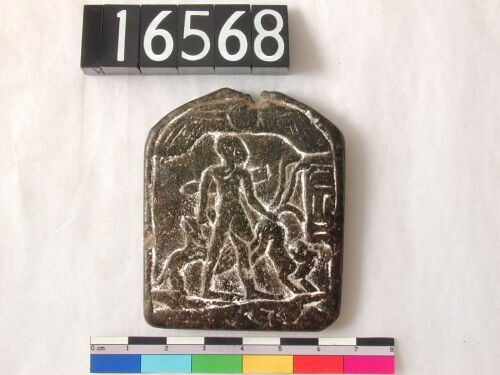 During the New Kingdom there were round-topped amulets with a depiction of a young regal god in similar pose as the child god on the later Horus stelae, but in profile, and named in the accompanying hieroglyphic inscription Shed 'the saviour'. A late Ramesside papyrus in Vienna preserves a handwritten copy of an incantation, to be recited for the same purpose as the later Horus stelae, and is followed by the oldest surviving description of such an amulet. From the same period, there is a statue of king Ramesses III, found on the desert road from the city of the sun-god Iunu (Heliopolis), with some of the same group of incantations. In the Ramesside and Third Intermediate Period there are examples with the figure of the child god in high relief, named as Horus, and bearing incantations. On some examples there is an incised depiction of the young regal god, named Shed 'the saviour', in a chariot hunting dangerous animals. Some of these example are dated to the reigns of kings Osorkon I and Osorkon II of Dynasty 22. The status of the Horus stelae: 'magic' versus 'religion'? These outstanding works of art belie the modern prejudice against the spoken word in healing; these cannot be called 'magical' in a demeaning sense in opposition to medical, and are not works of 'superstition' as opposed to art and religion. The larger Horus stelae include series of incantations, and are often numbered from the sequence on the Metternich Stela, first edited by W. Golenischeff, later by C. Sander-Hansen; of these, numbers 5 and 10 appear with particular frequency on the more select smaller versions. On the large example in the Petrie Museum, UC 16547, a version of incantation 5 covers lines 1-10 on the back, with incantation 10 in the following lines 11-15. Metternich stela incantation 5 is also found on a fine middle-sized example, UC 16548. Over time the carvers of the amulets produced more shapeless renderings of the signs; Sternberg-el-Hotabi 1994 documents the process of this dissolution of the script during the Ptolemaic Period. By the first century AD, the raised relief image of the divine child had been replaced by a profile figure, and the inscriptions were shorter incantations in the Greek script. These transitional forms were replaced by the smaller Roman Period amulets known in modern times as 'gnostic gems', carved from hard and often semi-precious stones, with images of deities or demons and short Greek inscriptions (example UC 52226); these circulated widely in the Mediterranean. O aged one, who rejuvenates himself in his time! Elderly one, who achieves youthfulness! Cause Thoth to come to me at my voice, that he may drive back for me the Backward-faced. great in his grasp, creating gods as a child. May the one on the water emerge intact. the weeping eye of Horus is approached. Back, you who are in the water! You enemy, dead male or female, adversary male or female, etc. Do not raise your faces, you who are in the water, at the passing of Osiris by you. Let him by to Djedet, with (your) mouths covered, your gullets blocked. Back, rebel! Do not raise your faces against the one who is on the water. the lords of the underworld who stand to slay you. the eye of Horus is on him to capsize you, placed on your backs. all people, all animals who are on the water today - protection. is the protection of the one who is on the water. a great cry of mourning in the mouth of the cat. 'look, look at the abed-fish, it is born'. I have turned back your advance, rebel! I am Khnum lord of Herwer. to that which you did in the presence of the Great Ennead. Hey, hey! I have said. a wailing over the violence that you inflicted, evil rebel? Back rebel - hey, hey! spoken on water or on land. Words spoken by Thoth the nurturer of the god of Pe. Hail god son of a god! Hail heir son of an heir! Hail Horus emerged from Osiris, born of Isis the goddess. to transfigure Ra in your glorifications. as you have made a boat sailing. Do it for me like the stone of the desert mountain, like the sherd edge in the street. so that your words are not rejected on account of it. See, your name is called today. May you create the raising of your renown, when you have lifted by your words of light. so that adoration is given to you by the populace. I am Horus the saviours.